Joseph Mages (1770), sketch, G.C.K. New York: New York Public Library. Ref. Archiv Moeck; Website: New York Public Library Digital Gallery (2013: ID 1270254) A portrait of the German painter Joseph Mages (1728–1769), possibly by his daughter. Mages plays a turned, three-piece, baroque alto recorder. Austrian-born Australian artist whose long career included fashion design, illustration for magazines and journals, painting, printmaking and drawing; made many portraits of Australian and other celebrities, including Geoffrey Blainey, Judy Cassab, Manning Clark, Arthur Boyd, Dame Joan Sutherland, Yehudi Menuhin and Luciano Pavarotti; born Vienna (1905), died ? Melbourne (2002). 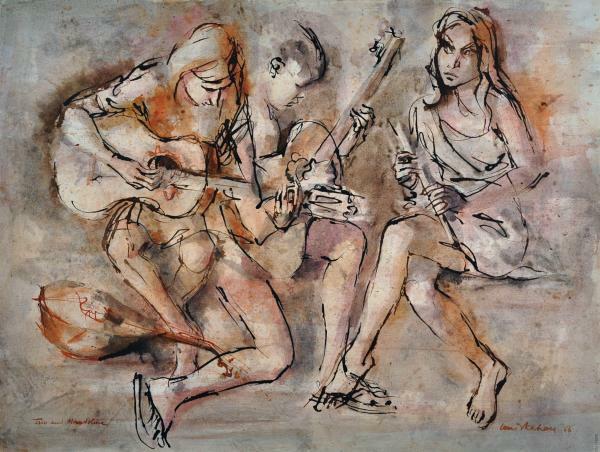 Two Guitars, Recorder and Piccolo (1967), ink and wash on paper on board, 63.5 × 87 cm, Louis V. Kahan (1905–2002). Malvern: Deutscher-Menzies Fine Art Auction House, 14 September 2006, Lot 322 (unsold). Two girls play guitars and a third holds a cylindrical soprano-sized recorder. In the background a very sketchily drawn young man is playing a pipe of some kind, but no details are shown. 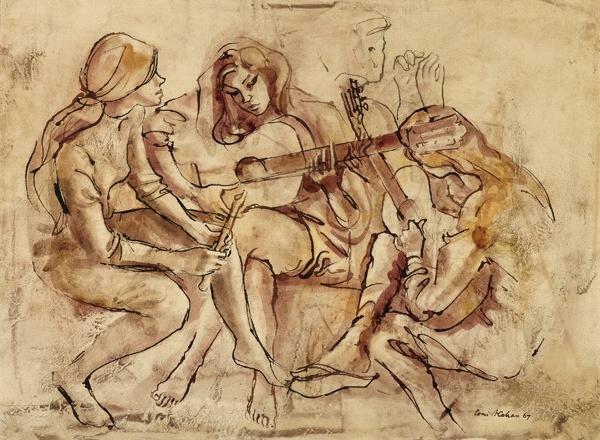 Trio and Mandolin (1988), ink and wash on paper on board, 63.5 × 87 cm, Louis V. Kahan (1905–2002). Adelaide: Elder Fine Art, Australian and International Paintings (?date). Ref. Website: Australian Art Auction Records (2014, col.) Two girls play guitars whilst a third sitting opposite them holds an alto-sized cylindrical pipe, possibly a recorder though no details are visible. On the ground, at the bottom left, is a mandolin. Russian figurative painter whose work includes portraits and still-lifes; born Kemerovo (1969). 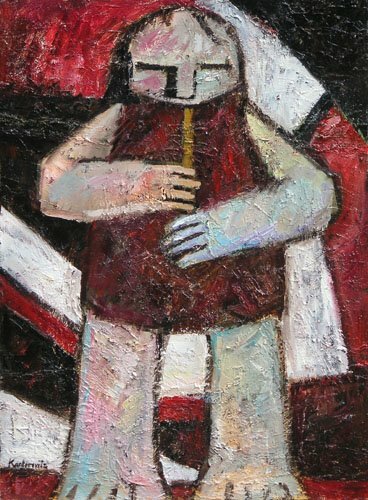 Boy with a Flute oil on canvas, 80 × 50 cm, Tatyana Kalin (1969–). St Petersburg: Academy of Arts Foundation. A young boy sitting on a bench holds a white (? plastic) neo-baroque recorder. Currently offered for sale. Boy on Skis Playing Carols, Christian Kampf (contemporary). Private Collection. Ref. Bridgeman Art Library (2002: Image KAM51572). A boy on skis stops in front of a screen standing on the snow to play his carols on his recorder. At his feet is a guitar. German porcelain maker who became chief modeler at the Meissen works where he established the porcelain figure as its own distinctive art form; his own works include large animal pieces and smaller figures and groups based on characters from the Italian commedia dell’arte; shepherds, huntsmen, monkey musicians, and actors were some of the more than a thousand different subjects he produced; born Fischbach (1706), died Meissen (1775). Shepherd Playing the Flute and his Dog (1747), Meissen porcelain figurine, 15.2 cm high, modeled by Johann Joachim Kändler (1706–1775) & P. Reinicke. La Jolla: Alcala Gallery, 18th-century Meissen Porcelain, 2004, Cat. CZ235 (B265). Ref. Adams (? date), Rückert (1977: Nr 972, pl. 236). Cross swords in under-glaze blue marking placed on rim at back of stand suggesting that this was an early model; minor restorations. A shepherd leans against a tree stump playing a flared-bell recorder, his dog at his feet. A Shepherd Musician and his Companion (ca 1755), a pair of German ormolu-mounted Meissen porcelain figurines, 29.2 cm high, modeled by Johann Joachim Kändler (1706–1775). London: Christie’s, Lot 50. Ref. Artfact (2004). There is a blue crossed swords mark at the back of her base. He wears a pale-yellow cape and patterned jacket with lilac breeches; she wears a headscarf, turquoise coat and pink flowered skirt. He holds a score; she plays a recorder; each with a sheep recumbent at their feet. On tree stump scroll-molded bases, damages and restorations to extremities. 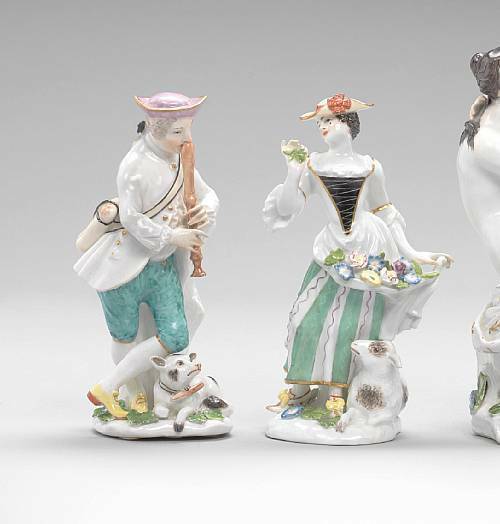 A Shepherd Musician and his Companion (ca 1765), 2 Derby porcelain figurines, 17.8 cm high, modeled by Johann Joachim Kändler (1706–1775). New York: Christie’s, European Decorative Arts, 5 February 1997, Lot 278. Ref. Artfact (2004). He wearing a pink hat and puce-lined yellow coat and playing a recorder; she wearing a yellow cap and flowered skirt, holding flowers, a lamb at her feet; both on rocaille-molded bases enriched in turquoise. See Twitchet (1980: fig. 87) for a variant example of the piper. Shepherd and Shepherdess (1665 & 1745), a pair of German ormolu-mounted Meissen porcelain figurines, 11 cm high, modeled by Johann Joachim Kändler (1706–1775) & P. Reinicke. London: Christie’s, Ceramics & Glass, 24 February 1997, Lot 362. Ref. Artfact (2004). He ca 1765, she ca 1745, the mounts 19th-century. He plays the recorder, in a yellow hat and floral jacket, turquoise breeches and yellow shoes with red rosettes, a bag slung over his shoulder, standing cross-legged with a dog at his feet. The shepherdess, wearing a pink hat and bodice, white apron filled with flowers and purple flowered yellow skirt, holds flowers in her right hand and stands with a sheep at her feet. On mound bases applied with flowers and foliage, mounted on ormolu scroll bases before scroll and trellis arbors applied with porcelain flowers (he with tip of his little finger, end of recorder and left front leg of dog lacking; she with fingers of her left hand, right thumb and part of brim of hat lacking; both with some chipping, chips to flowers, gallery of one mount partly lacking). 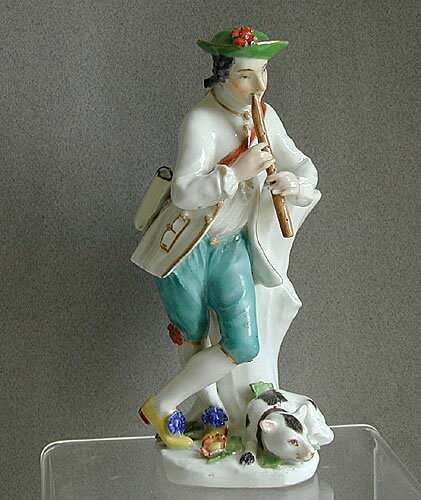 Flute-playing Shepherd with a Pug (ca 1745), Meissen porcelain figurine, 15.9 cm high, modeled by Johann Joachim Kändler (1706–1775). Frankfurt: Museum Angewandte Kunst, Inv. AL 358. Ref. RIdM Munich (2009, Fmk 56). A shepherd, leaning against a tree stump, with hat and bag slung over her shoulder, plays on a short, wide recorder. At his feet is a dog. Not seen. Shepherd and Shepherdess (ca 1750–1760), a pair of German ormolu-mounted Meissen porcelain figurines, 15.2 & 15.0 cm high, modeled by Johann Joachim Kändler (1706–1775). London: Bonhams (New Bond Street), Sale 16790 – Fine European Ceramics, 13 May 2009, Lot. 139 He plays a clearly depicted recorder, in a pink hat and white jacket, turquoise breeches and yellow shoes, a bag slung over his shoulder, standing cross-legged with a dog at his feet. The shepherdess, wearing a pink hat and black bodice, white apron filled with flowers and green, white and purple striped skirt, holds flowers in her right hand and stands with a sheep at her feet. Comedia dell’arte Characters: Harlequin (ca 1740), Meissen porcelain figurine, 18 cm high, modeled by Johann Joachim Kändler (1706–1775). Hamburg: Museum für Kunst und Gewerbe, Inv. 1922.148. Harlequin (damaged) with recorder (bottom). Not seen. Shepherd Playing a Recorder, Meissen porcelain figurine, 16.5 cm high, modeled by Johann Joachim Kändler (1706–1775) & P. Reinicke. New York: Christie’s, English and Continental Pottery, Porcelain and Glass, 19 April 1990, Lot 109. In yellow hat, green jacket, and puce breeches standing before a tree-stump and carrying a knapsack, his dog at his feet, on a flower-encrusted base (tip of recorder missing and chips). Shepherd (ca 1747), Meissen porcelain figurine, 16.5 cm high, modeled by Johann Joachim Kändler (1706–1775) & P. Reinicke. New York: Christie’s, Important French Furniture, Ceramics, Tapestries, and Carpets, 30 October 1996, Lot 76. Shown leaning against a tree-stump playing a recorder, wearing a yellow hat and coat edged in brown and turquoise breeches, an iron-red rosette at each knee, another applied to his hat, a black spotted hound recumbent at his feet, raised on a mound base applied with flowers and foliage, restored. Cf. Rainer Ruckert (1966: 180 & 236, nr 972) for a similar figure in the Residenz in Ansbach. 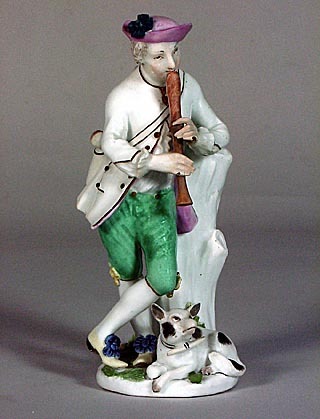 Shepherd Playing his Pipe (ca 1747), Meissen porcelain figurine, modeled by Johann Joachim Kändler (1706–1775) & P. Reinicke. Bourton-on-the-Water, Cheltenham: Judy & Brian Harden Antiques. Ref. Website: Judy & Brian Harden Antiques. (2005, col.) Shown leaning against a tree-stump playing a cylindrical recorder, wearing a green hat and coat edged in brown, and turquoise breeches, an iron-red rosette at each knee, another applied to his hat, a black spotted hound recumbent at his feet, on a flat base. Currently for sale; minor restoration. 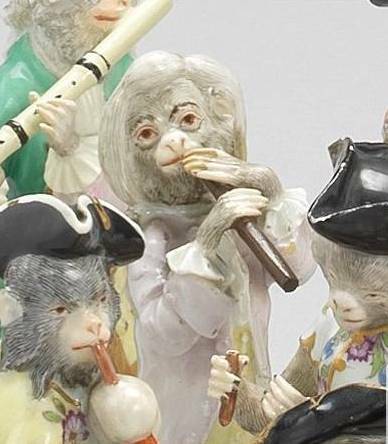 Monkey Orchestra (19th & 20th century), 10 Meissen porcelain figurines, 11.43–18.1 cm high, modeled by Johann Joachim Kändler (1706–1775) & P. Reinicke. Chicago: Sotheby’s, Centuries of Style, 18 October 1998, Lot 554. Comprising the conductor wearing an orange coat (right leg repaired), a turquoise-coated organist seated on the back of another monkey acting as the bellows, a cellist wearing a pink coat, a violinist wearing a yellow coat, a guitarist (missing fret) wearing a blue coat, a bassoonist wearing a yellow coat and plumed turban (one plume chipped), a turquoise-coated recorder player, a trumpeter wearing a yellow coat (some restoration to coat and trumpet), a fife and drum player wearing a lilac doublet and a double-drum bearer (one drum skirt chipped) wearing an orange turban (plumes restored); each sitting or standing by a tree stump on a gilt-heightened scroll-molded base, (minor imperfections), crossed swords marks in under-glaze blue, various impressed and incised numerals, and five with a painter’s mark in colored enamels. Monkey Orchestra (late 18th century), Meissen porcelain figurines, 12.5–14.5 cm high, modeled by Johann Joachim Kändler (1706–1775) & P. Reinicke. London: Bonham’s (New Bond Street), Sale 16790 – Fine European Ceramics, 13 May 2009, Lot 149. 12 monkey musicians each on a gilt-edged, scroll-molded base applied with flowers and leaves, comprising: one triangle player, one bassoon player, one horn player, one flautist, one recorder player, one drummer, one bagpipe player, one cellist, one female singer and two seated organ players, together with a female hurdy-gurdy player, the latter probably 19th century, 12.5cm to 14.5cm high, crossed swords marks in under-glaze blue, the organ players with dot marks, the flautist and the horn player with impressed numerals 14 and 70 respectively. The recorder (so-described in the catalogue) is a cylindrical pipe with no distinguishing features. Boy with a Flute (20th century), Polychrome painted porcelain figurine, 13.5 cm high, Meissen after Johann Joachim Kändler (1706–1775). Hamburg: Auktionshaus Stahl, Lot 613, November 2012. Ref. Katalog Nr. 311 (2012, col.) From the famous series of “Gärtnerkinder (Gardener”s children)”. A young boy in a tricorne hat, red jacket and purpule pants stands playing a baroque recorder apparently modelled on one by Heitz with ivory mounts and beak and with tortoise-shell veneer. Contemporary USAmerican children’s book writer and illustrator; her paintings seem to revolve around angels and landscapes; born France but resident in USA since 1985. Artists web-site. Angel with a Flute, oil on canvas, 61 × 46 cm, Sylvie Kantorovitz (contemporary). A stylised image of a pudgy girl wearing a smock pulled up around her ears playing a vertical pipe, probably a duct flute, possibly a recorder. Flute in Mountain, oil on canvas, 30.5 × 22.9 cm, Sylvie Kantorovitz (contemporary). A stylised image of a man against a mountainous landscape playing a vertical pipe, probably a duct flute, possibly a recorder. Flute, oil on canvas, Sylvie Kantorovitz (contemporary). A stylised image of a man against a geometric background playing a vertical pipe, probably a duct flute, possibly a recorder. British portrait painter, draughtsman and caricaturist who during his career depicted many of the most famous politicians, artists and musicians of the time; later in life he abandoned figurative work and embraced abstract painting; born London (1890), died 1978. Portrait of Arnold Dolmetsch (a. 1926), print of an ink drawing, 204 × 255 cm, Edmond Xavier Kapp (1890–1978). London: Royal Academy of Music, Inv. 2006.2812. The head of a puckish Arnold Dolmetsch with his two-pointed beard is surrounded by a few of the instruments with which he is associated: the scroll neck of a viol signed in the print ‘Kapp’, a viola da gamba, virginals ( inscribed ‘Arnold Dolmetsch fecit’ and ‘Plus Fait Douceur Que Violence’ in the lid of the instrument) and a reproduction of Beernard Picart’s Recorder Player’s Hands, the frontispiece of Principes de la flûte traversière (1707) by Jacques Hotteterre (1674–1763). The original drawing is reproduced in the book by Kapp’s wife, Yvonne Cloud (Yvonne Kapp), Pastiche: A Music-Room Book (1926: facing page 5). Contemporary Israeli artist; known for his darkly coloured figurative oil paintings of judeo-slavic themes; his style ranges from cubism to expressionism; born Warsaw (1937). See here. 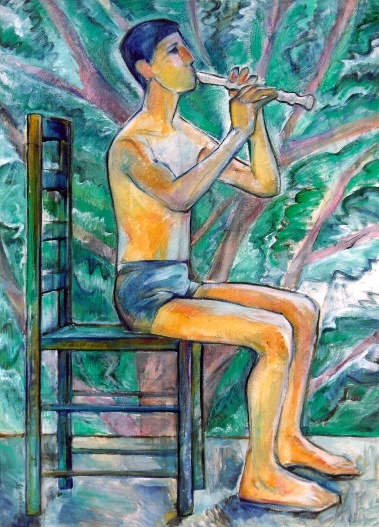 Recorder Player, oil painting, 114.3 × 83.8 cm, Joel Kass (1937–). Antwerp: Campo & Campo, 29 October 1996, Lot 678 : Ref. Artfact (2004). Not seen. 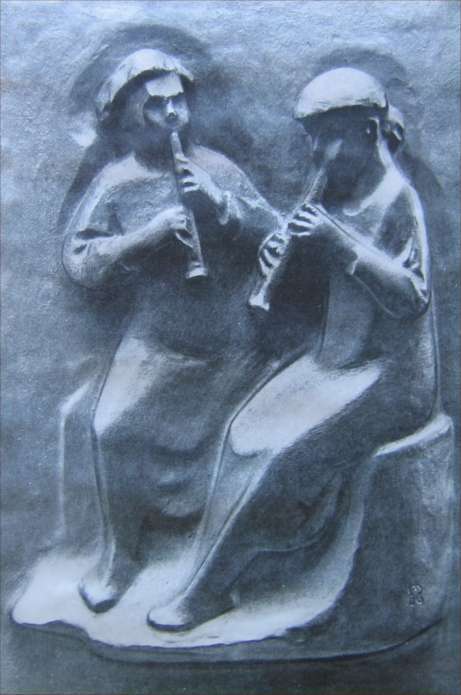 Flute Player (1972), ceramic tiles, 45 × 75 cm, Joel Kass (1937–). A man with one eye shut plays a stylised cylindrical recorder. Austrian draughtsman and engraver who was part of the generation of artists who tried to introduce neo-classical ideas to Austria; he brought to Vienna a new approach to portraiture, showing the sitter from below to achieve a stronger presence of the them; the technique of using only of red chalk and parallel hatching for the surface structure was also new; born Graz (1741), died Graz (1816); son of copper-plate engraver Johann Michael Kauperz. Recorder Player, Johann Veit Kauperz (1741–1816). Berlin: Kunstbibliothek, Inv. 918a,17. Ref. Munich RIdIM (2009, Bkb – 444). A boy with a cap sits at a table playing a recorder from an open music book. Not seen. Contemporary USAmerican artist living in California; her style combines combine the traditions of Russian art with those of abstract expressionism; her subjects include still-lifes, portraits, abstract landscapes, and figurative work; born Samara, Russia (1960). Artist’s Web-site. Flautist (1995), oil on canvas, 76.2 × 106.7 cm, Maria Kazanskaya (1960–). A young man wearing only his underpants sits on an upright wooden chair playing a white, alto-sized recorder. 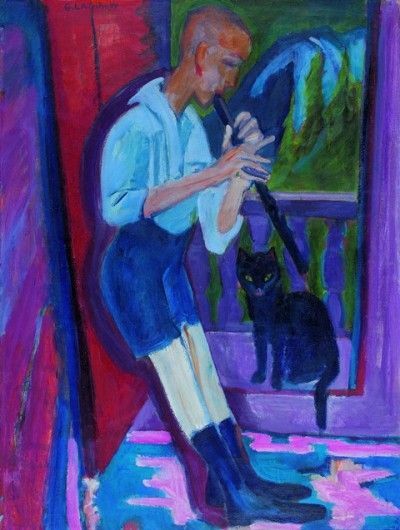 Flautist II – Snake Charmer (1998), oil on canvas, 45.7 × 43.2 cm, Maria Kazanskaya (1960–). A young man wearing only his underpants sits cross-legged on the ground playing a white, alto-sized recorder. English book illustrator who had a highly distinctive style, achieving an unusual smoothness of texture in his illustrations, both in colour and black and white; op. late 20th century. Flutes Being Played, gouache on paper, John Keay (op. late 20th century). Private Collection. Ref. Bridgeman Images, LAL453507 (2014, col.) Three men in period dress play two alto and 1 tenor recorder. 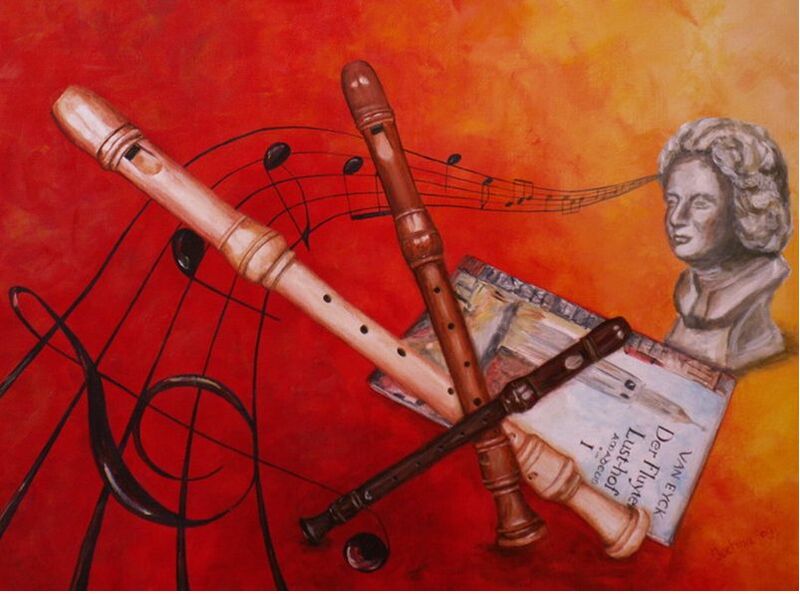 The instruments are perfectly depicted renaissance-style recorders. Danish painter, active in Italy where he painted portraits, decorated palaces, and was employed by churches and religious orders, executing works such as the Virgin with St Elia for the Carmelites in Venice and the Virgin and St Dominic for the refectory of the monastery of S Bartolomeo in Bergamo. born Helsingör (1624), died Rome (1687). Group of Peasants Resting after the Harvest, Bernhard Keil (1624–1687). Location unknown: offered for sale by Sotheby’s, Florence, 18 October 1969, Lot 103. Ref. Warburg Institute, London. An weary old man leans on his hand, a woman puts down her basket and a seated young woman looks dreamily into the distance, a basket of fruit in her lap whilst a young lad plays a flared bell recorder. Surely the young woman is far too well dressed (with a pearl necklace) to be a peasant. 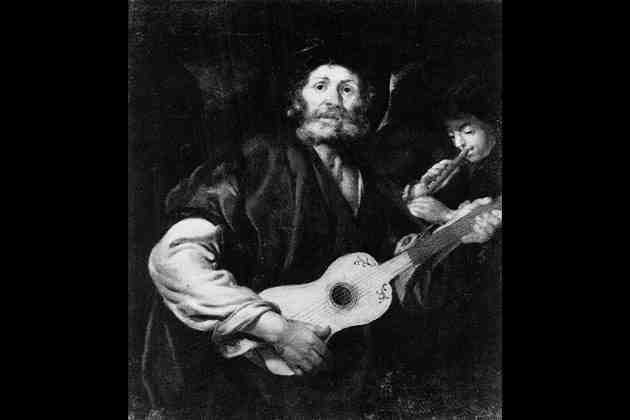 Man playing a Guitar, oil on canvas, Bernhard Keil (1624–1687). Ref. Gabrius Data Bank (2002, b&w.) A man plays a guitar. Behind him a young boy plays a cylindrical recorder right hand uppermost; four finger holes are visible. 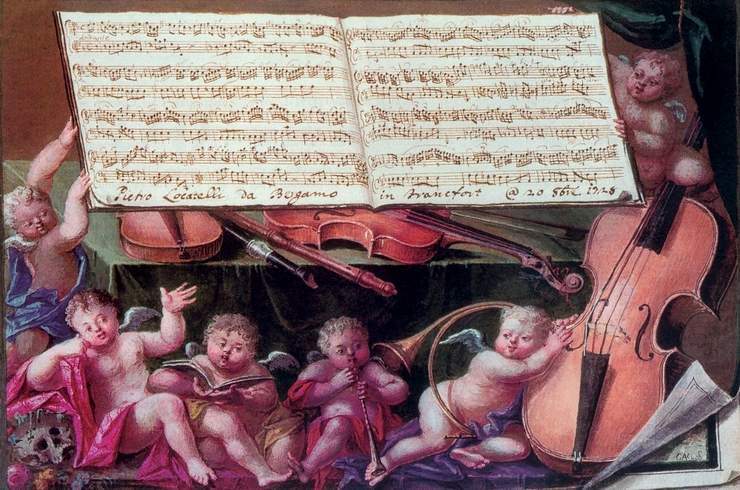 A detail (perhaps a copy) of Keil’s Strolling Musicians, Museo Civico, Padua (see below). Strolling Musicians (1650–1660), oil on canvas, Bernhard Keil (1624–1687). Padua: Museo Civico. Ref. Angelo Zaniol (pers. comm., 2004 – monochrome). Once housed in the monastery of S. Maria di Praglia. A man plays a guitar. Beside him a young woman plays a tambourine with jingle rings. Behind them a young boy plays a cylindrical recorder right hand uppermost; four finger holes are visible. 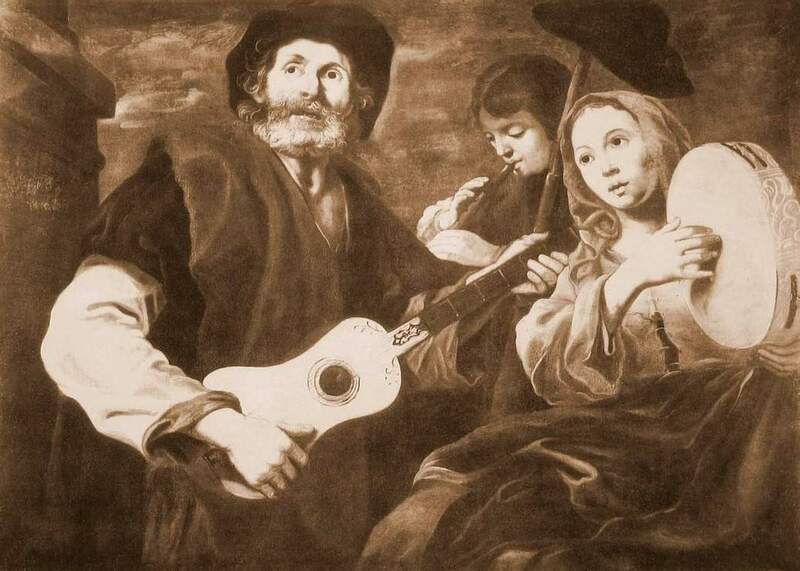 The man and woman in this painting are identical to Keil’s Man Playing a Guitar noted by Gabrius (2002, see above). [Shepherd Boy], 51.7 × 127.0 cm, Bernhard Keil (1624-1687). Location unknown: auctioned Christies, London (2001); formerly collection of Michael Kroyer, London. Ref. Website: Artfact (2005, col.) A recumbent shepherd boy with a sleeping dog by his side, a wicker basket at his feet. In front of him lies a small, flared-bell recorder, clearly depicted. Boy with Flute, painting, Bernhard Keil (1624–1687). Marano di Castenaso: Villa Molinari Pradelli. Ref. Universitatario Olandese di Storia dell’Arte Firenze, Special Photo Study Collections, Image 0028137 (2009, b&w). A young boy in a felt hat leans against a table, soprano flared-bell recorder in his hand. Man Playing a Flute, painting, attributed to Bernhard Keil (1624–1687). Location unknown. Ref. Universitatario Olandese di Storia dell’Arte Firenze, Special Photo Study Collections, Image 0028151 (2009, b&w). 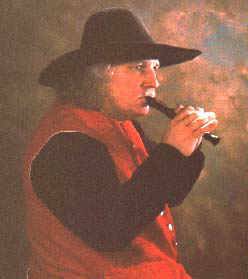 A man in a floppy hat and a skin jerkin plays a slender soprano-sized flared-bell pipe, probably a recorder. Young Huntsman Playing a Recorder to Girl in Landscape, painting, 121 × 98 cm, attributed to Bernhard Keil (1624–1687). London: Sotheby’s: 10 December 1980, Lot 198. Ref. Getty Research Institute for the History of Art and the Humanities: Photostudy Collection (1999); Rijksbureau voor Kunsthistorische Documentatie, The Hague ex Ruth van Baak Griffioen (pers. comm., 2003); Wikimedia Commons (2014, col.) With a powder-horn under one arm, a young lad sits playing a perfectly depicted hand-fluyt (even the maker’s mark is visible) to a young girl who holds an open songbook. Between them lie a dog, a quiver of arrows and a flintlock pistol. Formerly attributed to Barent Fabritius (1622–1673). Peasants Making Music painting, 42 × 51 cm, after Bernhard Keil (1624–1687). Locality unknown: formerly Ruthrauff collection, New York. Ref. Universitatario Olandese di Storia dell’Arte Firenze, Special Photo Study Collections (2011-b&w). A young lad half lying on the ground, a dog asleep before him, is serenaded by an old man, a young woman and a boy who play, respectively, guitar, tambourine (with jingle rings) and a small, slender duct flute, possibly a recorder. The young woman has her hands around the lad’s shoulders as if to console him. English stained glass designer whose London studio supplied not only stained glass to but also furnishings and vestments; at the peak of its success Kempe’s Studio employed 50 artists, designers, draughtsmen and glass painters; on his death the firm passed to his cousin, Walter Tower (1873–1955), but as the Gothic cult faded and in the sad years of the Great Depression, the demand for expensive memorials ceased and after 60 years and the making of over 4,000 windows Kempe’s closed down in 1934; born Ovingdean Hall, near Brighton (1837), died London (1907). 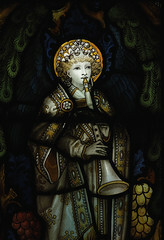 Angel Musician (19th century), stained glass, Charles Eamer Kempe (1837–1907). Lichfield: Cathedral, St Chad’s Head Chapel An elaborately dressed angel plays a duct flute with an unusually wide bell, the beak, window/labium and several finger holes clearly depicted. The instrument appears to be in two parts. Other angels play portative organ and cymbals. Although the chapel was added in the 13th century all stained glass in the Cathedral was destroyed during Civil War. However, that in the Lady Chapel is medieval Flemish dating from the 1530s originally from the Abbey Herkenrode, near Liège in Belgium. There are also some fine windows by Betton and Evans (1819), and many fine late 19th century windows, particularly those by Charles Eamer Kempe, of which this is an example. Spanish-born artist who moved to Netherlands; born 1503, died 1580. The Nativity Shepherds, Peter de Kempener (1503–1580). Detail. Berlin: Staatliche Museen Preußischer Kulturbesitz, Gemäldegalerie, 1597. Ref. Munich RIdIM (1999, Bgd – 20); Anthony Rowland-Jones (pers comm., 2001). 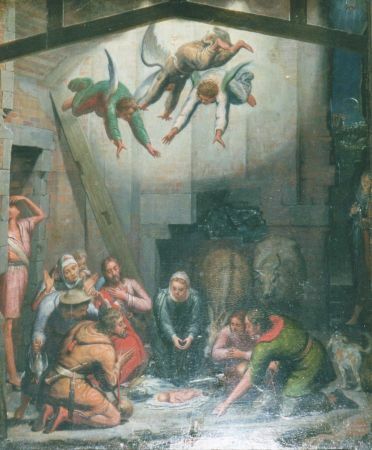 Mary and the shepherds admire the Christ-child whilst three angels tumble from the rafters of the stable. 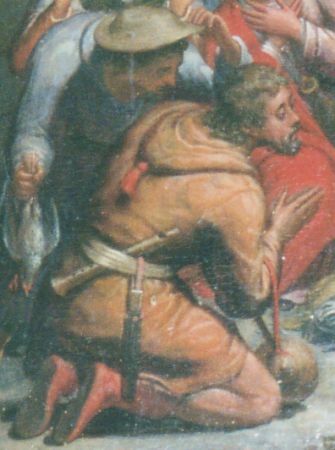 A shepherd kneeling in the left foreground has a flared-bell recorder of alto size stuck through his belt. The window/labium and six finger holes are clearly depicted; another finger hole could be hidden by the man’s belt. Flemish artist; active Antwerp (1643). The Contest Between Apollo and Pan Judged by King Midas, (1643), oil on panel, 50.3 × 67.4 cm, P. V. Kerk (op. 1643). London: Sotheby’s, Sale L08037, Old Master Paintings Day Sale, Session 1, 4 December 2008, Lot 111. Watched by the Muses and and a number of satyrs, Apollo plays his viola da braccio to Pan seated before him. King Midas points towards Pan as the winner of the contest, and the mountain god Timolus raises his hand as if about to announce his verdict. At Pan’s feet lie a small shawm, a lute, and what may be a monochord. One of the satyrs with his back to us holds a cylindrical pipe, possibly a flute, though only the head is out of sight. In front of this satyr, three putti squabble over a flared pipe held by one of them, probably a recorder, though again the head is out of sight. A winged putto hovers overhead with a myrtle wreath which he is about to drop on Apollo’s head. Flemish artist famous today for his tiny, meticulously rendered pictures of insects; born Antwerp (1626), died Antwerp (1679). Hearing [One of the Five Senses] (1659), copper, 78.5 × 110.5 cm, Jan I van Kessel (1626–1679). Paris: Louvre. Ref. JMA (1966: 165, 167-168, figs 17–20); Leppert (1977: 88). An allegorical still-life depicting many musical instruments, including two duct flutes (flageolets or recorders) with five finger holes visible on each as well as a smaller whistle. Allegory of Hearing, panel 56 × 89 cm, Jan I van Kessel (1626–1679). Private Collection. Ref. Buijsen & Grijp (1993). Music plays a theorbo on the terrace of a house, surrounded by animals and instruments of music, including a duct flute lying in the right hand corner between a shawm and a bassoon. A small monkey blows a trumpet and holds what looks like a second duct flute (probably a recorder) in his right hand. Scene from the History of the Family of Moncade, Count of Aytona, oil painting, Jan I van Kessel (1626–1679) & David II Teniers (1610–1690). New York: Private Collection. Ref. Leppert (1977: 89, pl. XXVI, b& w). A military portrait surrounded by a decorative frame with coats of arms, armour, plate, jugs, bowls, bird concerts and musical instruments including citterns, lute, rebecs, shawms, trumpets, tambourines and a small cylindrical recorder (bell not visible). This is a cartoon for a series of tapestries. 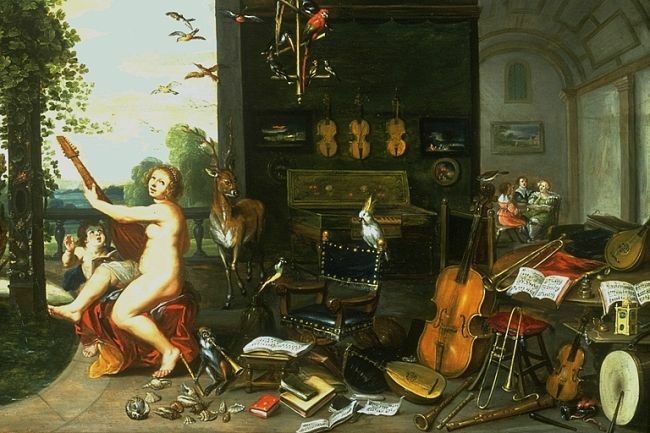 Amor docet musicam (ca 1650), 57 × 77 cm, attributed to Jan I van Kessel (1626–1679). Austria: Private Collection. Ref. JMA (1966: 171, fig. 22); Leppert (1977: 89). 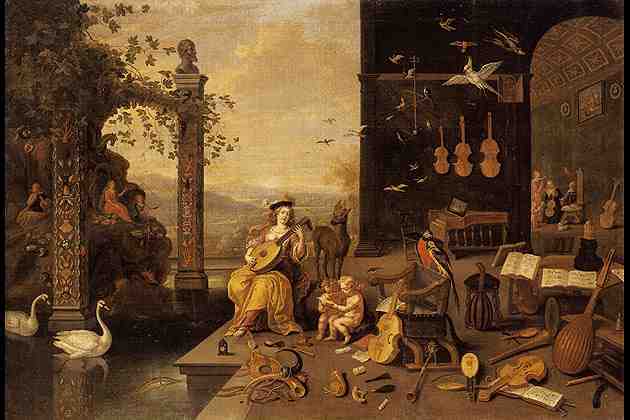 An allegorical still life on a palace terrace in which three nobles sing and play lute and virginals; two putti play violin and viol; and a number of instruments lie unused including harp, cittern, lute, rebecs, viols, violin, mute cornetto, flutes (in a case), horns, bird-calls, and a duct flute (flageolet or recorder). Personification of Music, oil on canvas, Jan I van Kessel (1626–1679). Ref. Gabrius Data Bank, OMP (2002, col.) On a terrace before an open gallery, a young woman plays the lute. To the left is an elaborate pond with fish, swans and an island. Behind her stands a deer, with a few to the countryside beyond. At her feet sit two putti, littered on the ground all around are music books and instruments of every description including cittern, horns, viols, lutes, trumpets, a cornetto, and a small recorder lying on its front in the bottom right corner with its characteristic beak clearly visible. Against a wall stands a Flemish-style harpsichord above which hang three viols. Through the gallery a viol ensemble can be seen rehearsing. Birds fly about above, and two parrots perch on the back of a convenient chair. Dutch painter, draftsman, graphic artist and manufacturer of woodcuts; best known as a painter of meticulously painted still-life and portraits which appeared after 1930 when, due to the effects of a heart condition, he was forced to withdraw to his studio; from 1919 on, he was an ebullient painter, rendering his impressions spontaneously onto canvas in deft brush strokes. he chiefly painted landscapes and cityscapes, often painting outdoors; born Den Helder (1902), died Ede (1940). Still-life (1939–1940), oil on canvas, 65 × 56 cm, Dirk Hendrik Ket (1902–1940). Private Collection. Rijksbureau voor Kunsthistorische Documentatie, illustration 170717 (2014, col.) A still-life comprising two bottles, a bowl, a card, some papers an egg-shell, and a duct flute (possibly a recorder but more likely a flageolet) with 4 keys. Very similar to the painting below, but with some noticeable differences. Still-life (1937–1938), oil on canvas, 65.0 × 56.5 cm, Dirk Hendrik Ket (1902–1940). Arnhem: Museum voor Moderne Kunst, Inv. Röl 1. Rijksbureau voor Kunsthistorische Documentatie, illustration 170716 (2014, col.) A still-life comprising two bottles, a bowl with a peeled egg in it, a card, some papers an egg-shell, and a duct flute (possibly a recorder but more likely a flageolet) with 4 keys. Very similar to the above, but with some noticeable differences. Still-life , oil on canvas, Dirk Hendrik Ket (1902–1940). Location unknown. Ref. Website: Pinterest (2014, col.) A still-life comprising a brown gin bottle, a bowl, some papers, and a keyed duct flute (possibly a recorder but more likely a flageolet) viewed in side profile with 4 keys visible. Dutch Golden Age painter known for portraits and genre works with soldiers and horsemen; born Delft (1603), died Amsterdam (1652); father of painter Cornelis Kick (1634-1681). Elegant Company of Men Singing and Playing Music in an Interior(1640–1649), oil on panel, 54 × 41 cm, Simon Kick (1603–1652). Karlsruhe: Staatliche Kunsthalle , Inv. 1477. Ref. Website: gallica (2012-b&w); Rijksbureau voor Kunsthistorische Documentatie, illustration 256028 (2014, b&w). A man sitting on a stool plays a small slender cylindrical pipe, possibly a duct flute. Seated at a table opposite the musician, another man conducts from a music book. Two other men look on whilst a third man unpacks a harp. German engraver whose copies of works by Titian, Veronese, Tintoretto and Palma Vecchio include the only records of now untraced paintings; born and died Augsburg (1579–1637). Cleio [sic. ], engraving by Wolfgang Kilian (1581–1662), after Luckas Kilian (1579–1637). The Hague: Gemeentesmuseum, Music Department. Ref. Anthony Rowland-Jones (pers. comm., 2001). Clio, the Muse of history, plays Gloria in excelsis DEO, the music on her positive organ (a nice mixture of Classical and Christian themes!) Beside here is a virginal. On the ground are a cornetto, a dulcian, more music, and a recorder of which only the well-shaped beaked mouthpiece, window/labium and the first four finger holes of which are visible). German engraver, reckoned among the most meritorious historical engravers of that nation; his subjects included historical and religious scenes and portraits; member of a family of artists born and died Augsburg (1714–1759). [Hands], print after Picart (Hotteterre, Principes) or possibly Watteau, by Philippe Andreas Kilian (1714–1759). Berlin: Staatliche Museen Preußischer Kulturbesitz, Kupferstichkabinett (West), 10590. Ref. Munich RIdIM (1999, Bkk – 254). Study of a recorder player’s hands playing a three-piece alto baroque recorder. A leading Russian portraitist in the Age of Romanticism who also achieved international recognition; he lived and worked in Moscow, Tver and St Petersburg, Rome and Napoli; his most familiar work is probably his portrait of Alexander Pushkin; born Koporye near Saint Petersburg (1782), died Rome (1836). Blind Musician (1820), drawing, Orest Adamovich Kiprensky (1782–1836). Location unknown. Ref. Website: WikiArt (2011). A man in a high-collared, buttoned jacket with his eyes firmly shut plays a three-piece, alto-sized recorder, details of the beak, window-labium and foot with its hole for the little finger of the player’s right hand clearly visible. Father Athanasius Kircher (1602–1680) was a member of the Society of Jesus, and became known as one of the foremost scientific writers of his time. The two volumes of his Musurgia Universalis ive ars magna consoni et dissoni in X. libros digesta … were published in in Rome (1650) and is one of the seminal works of musicology and was hugely influential in the development of Western music – in particular on J.S.Bach (1685–1750) and Beethoven (1770–1827). Ordinary Wind Instruments, copper plate. from Musurgia Universalis, Vol. 1: 543, fig. 500 (1650), copper plate, Athanasius Kircher (1602–1680). Glasgow University: Ferguson Collection, Af-x.9 & Af-x.10 & E.x.42-42bis & Bk4-d.5; University of Reading Library Special Collections, Tim Eggington Library; Berlin: Ref. Book of the Month (November 2002); Website: European Cultural Heritage (ECHO) (2008). This plate depicts a number of woodwind and brass instruments, including trumpets, cornetto, shawms, trombones, organ pipes, signal horns, flute, a fistula triventi (a cylindrical duct flute with holes for three fingers), a fistula hexastoma (a conical duct flute with holes for two fingers of the upper hand, three for the lower hand and, presumably, one at the rear for the thumb), and a recorder with a thumb hole and seven finger holes (one too many), the lowermost with a key and covered by a fontanelle. The beak of the recorder is coroniform and may have been held flush with the player’s lips and mouth rather than beaked. German wood engraver; active 1552–1570. Three Musical Couples in the Bath-house, print, Michael Kichmaier (op. 1552–1570). Berlin: Staatliche Museen Preußischer Kulturbesitz, Kupferstichkabinett (West), 4861. Ref. Munich RIdIM (1999, Bkk – 261). Three couples sit around a spinet (or clavichord) played by a woman. One of the men sings from a music book; the other two men play waisted fiddle and an alto cylindrical duct flute (probably a recorder). The window/labium of the latter is clear, and all fingers of both hands seem to be involved in covering holes, certainly the little finger of the lowermost (left) hand. All are naked or nearly so. An elaborate frame depicts the heads of one of the Four Winds in each corner. German-born artist who lived and worked in Davos from 1917 until his death; born Aschaffenburg (1880), died Davos (1938). Der Flötenspieler (1922/3), oil on canvas, 118 x 89 cm, Ernst Ludwig Kirchner (1880–1938). Davos (Switzerland): Kirchner Museum. A portrait of Hans Staub, the son of Heinrich Staub who was the chief doctor of a sanatorium in Davos. Watched by his dark blue cat and leaning against an open door, a balding man in a blue shirt, shorts and socks plays a dark blue cylindrical pipe of at least tenor size. Since it is held vertically it must be a duct flute and a recorder seems an obvious possibility, though no details are visible. The portrait is painted at the rear of another painting, a landscape of the dunes in Fehman. Contemporary US American artist, composer and recorder player. Artist’s web-site. 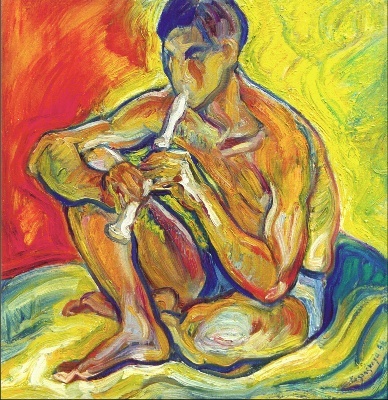 Arthur Playing the Piccolo Recorder, Arthur Paul Kirmss (contemporary). The artist in side-profile wearing a black hat and a red waistcoat plays a small neo-baroque (? sopranino) recorder. [Arthur with his Recorder], Arthur Kirmss (contemporary). The artist standing wearing period costume holds a slenderly conical pipe, probably a recorder. Spirit of the Renaissance, painting, Arthur Kirmss (contemporary). CD cover: Spirit of the Renaissance. “The painting represents a consort of woodwind players dressed in clothing of the 16th and 17th centuries. From left to right they are playing alto cornet, alto shawm, great bass crumhorn and alto recorder. They are standing in a wooden kiosk roofed with painted and gilt scale shingles, whose walls are hung with coats of arms. The wooden enclosure is surrounded by plant forms which appear to fly outward. The tendrils and leaves lower down are deep blue while those rising higher turn to green and burst into bloom. This blossoming is brought about by the sounds of the music. This is the ‘Spirit of the Renaissance’, or rebirth of musical culture of the Western world” (Arthur Kirmss). German sculptor; his subjects were animals and people, particularly affectionate images of children playing, making music, etc. ; his sculptures decorate urban spaces and schools in Berlin, Erfurt, Dresden, Potsdam and Brieselang where he lived and worked for some 60 years; born Berlin (1899), died Brieselang (1993). Flötenrelief (1956), clay relief sculpture, 28 × 20 cm, Hans Klakow (1899–1993). Private Collection. Ref. Deutsche Fotothek, Dresden & Deutsche Akademie der Künste, Berlin (Walter Bergmann ex Anthony Rowland-Jones, pers. comm. 2005, b&w); Wehnert (1970); Archiv Moeck. A boy and a girl, both in long robes, sit together playing recorders of slender conical profile with a flared foot. The window/labium of each is hinted at, and all fingers seem to be in play. German decorative artist, portraitist and painter of classical mythological subjects; he also designed porcelain figurines; his portraits include Beethoven; born Breslau (1793), died Berlin (1864). Jubal Inventing the Flute (1839), oil painting, tondo, Friedrich August von Kloeber (1793–1864). Berlin: Alte Nationalgalerie, A5200. Seated in the forest, Jubal, surrounded by children, goats and a huge dog, makes pipes for his young companions one of whom sits at his feet testing a prototype which would seem to be a duct flute of some kind. Swedish painter and drawing master at Uppsala University; born ca 1670, died 1734. Trompe l’oeil, oil on canvas, 90 × 79 cm, Johan Klopper (ca 1670–1734). Stockholm: Nationalmuseum, NM 6764. Ref. Legêne (1995: 123); Sidén (2001: 155, pl. 11, col.) Pinned against a wooden panel are a portrait of the artist, several drawn portraits and a landscape, two pens, two quills, a document in Hebrew, a sheet of music, and a small duct flute. Legêne refers to a flared-bell, ‘wave profile’ recorder depicted in this painting. However, although the instrument does have wave profile it is actually a flageolet (fistula hexastoma) with but four finger holes (visible) and two at the rear for the thumbs (not seen here). German painter and lithographer; produced watercolours of landscapes with mythological figures; later he was active as a portrait painter in Vienna, Prague, Dresden, Berlin and Copenhagen; after a stay in Paris, Klotz worked more in the French portrait tradition; in 1804 he was appointed Professor of the Theory of Visual Arts at the Universität Landshut; born Mannheim (1776), died Munich (1824); son of the Mannheim court theatre painter Mathias Klotz (1748–1821). Two Shepherds in a Landscape (18–19th century), ink wash & pencil on paper, 21.1 × 28.0 cm, Simon Petrus Klotz (1748–1821). German. Munich: Staatliche Graphische Sammlung, Inv. 21663. Ref. Munich RIdIM (2009, Mgs – 322). On a hill overlooking a lake, two shepherds sit beneath the trees. One of them makes music on a recorder, the second listens attentively. Not seen. Dutch draughtsman and painter; with fellow artist Jan Kip (1652/53–1722,) he made something of a a specialty of engraved views of English country houses, represented in minute detail from the bird’s-eye view that was a long-established pictorial convention for topography; born Haarlem (1650); died London (1722); son of landscape painter Wouter Knijff (1605–1694), brother of painter Jacob Knijff 1639–1681). Vanitas (c. 1681), oil on canvas, 76 × 63 cm, Leonard Knijff (1650-1722). Munich: Private Collection. Ref. Rijksbureau voor Kunsthistoriche Documentatie, illustration 172834 (2014, col.) On a draped table are an ornate candlestick, a gilt jug, a pearl necklace in a carved box, a recorder, a ribbon, a bunch of grapes, and some papers labelled with the painter’s name. The recorder is of baroque design; only the head and upper body are visible. German soldier, portrait and landscape painter, theatre manager, landscape designer, and interior decorator and foremost architect in the service of Frederick II of Prussia; born Crossen an der Oder (1699), died Berlin (1753). Gilded plaster trophy, appliqué on a pale green marble with red veining, Georg Wenzeslaus von Knobelsdorff (1699–1753). Berlin: Charlottenburg Palace, New Wing, Golden Gallery. Ref. Anthony Rowland-Jones (pers. comm., 2001). A trophy on the North side of the Gallery shows the underside of a recorder of alto/tenor size. The beak and windway opening are very clear and there is a turned decorative ring before the thumb hole position which is obscured by other elements of the design. The body is cylindrical at first, then slightly tapered towards the bell flare which has two decorative rings. Dutch painter and draughtsman, active in Utrecht; apart from a few battle scenes, genre scenes and portraits, he concentrated primarily on small-scale history paintings inspired by rederijker theatres, the local rhetoricians’ guilds that put on amateur performances; despite a sketchy technique and loose brushwork, his paintings are characterised by their warm tones and dramatic chiaroscuro; born ca 1603, died 1655. See collaborative works with Jan Both (ca 1618–1652). Amarillis Crowning Mirtillo, oil on panel, 38.1 × 62.2 cm, Nicolaus Knüpfer (ca 1603–1655). Augsburg: Städtische Kunstsammlungen, Inv. 12339. Ref. Kettering (1983: fig. 173); Griffioen (1988: 440–441); Munich RIdIM (1999, Ask – 25); Rasmussen (1999, Tambourine); Anthony Rowland-Jones (pers. comm., 1999). In a scene from the pastoral play Il Pastor Fido (The Faithfull Shepherd) by Guarini (1538–1612), Amaryllis crowns the kneeling Mirtillo, a rustic youth who has dressed himself as a woman to gain her presence. Behind Amaryllis, a woman plays a soprano recorder (left-hand lowermost). To the right of the central scene, a bare-breasted woman strikes a tambourine. Several of Amaryllis’ companions stand about. In the background, nymphs dance in a circle. Portrait of the Artist and his Family (ca 1645), oil on panel, 50 × 55 cm, Nicolaus Knüpfer (ca 1603–1655). Dresden: Staatliche Kunstsammlungen, Inv. 1258. Ref. Fischer (1975: 84–85, pl. ); Anthony Rowland-Jones (pers. comm., 2001). Includes two young children and an infant, the latter standing naked on a table held by her mother and holding a pipe to her mouth with four fingers of her right hand in good lower-hand recorder playing position. The instrument is beaked, but no window/labium or finger holes are visible. It is cylindrical or slightly outwardly conical with a small and short flare at the bell. Knüpfer holds a book of music of So d’ouden songen, so pipen de jongen [As the old people sing, so the youngsters pipe]. As Knüpfer married in 1640, Fischer (loc. cit.) deduces ca 1645 as the date of this painting. He then considers the relation between this picture and those of his pupil Jan Steen with whom this subject was a particular favourite. Notes by Rowland-Jones (loc. cit.) A small bird-cage hangs in a window alcove. Stammbuch di Hendrick van Uchelen [Family Guestbook Hendrick van Uchelen] (1728), 16.3 × 11.0 cm, Georg Anton Koch (1685–1757). Frankfurt: Museum Angewandte Kunst, Bibliothek, Inv. L.St. 3. Ref. Hortus Musicus 1 (4): 58, col. (2000); Website: Stichtung Fondazione Pietro Antonio Locatelli (2003); RIdM Munich (2009, Fmk 92); Website: gallica (2012, b&w, attributed in error to Pietro Locatelli; image is reversed). A manuscript score of a preliminary version of the Andante movement of Pietro Antonio Locatelli’s Sonata III, Op. 2 is held open above a table by two putti. On the table and partly hidden by the music score are two violins, a transverse flute and a recorder. In front of the table, a putto leaning against a skull conducts two more putti who sing and play shawm respectively. A third member of the band with a horn slung around his body pushes another violin aside. The recorder appears to be made of ebony and has a metalic (? silver) mount between the head and the body. Hendrick van Uchelen was a man of affairs of Dutch origin resident in Frankfurt at a time when the composer Locatelli (1695–1764) was working in Germany. Celebration Plate for the 200th Anniversary of the Augsburg Confession, etching and engraving, 42.7 × 33.0 cm, Johann Christoph Kolb (1680–1743). New York: C. & J. Goodfriend, Online Exhibition – The Musical Scene Five Centuries of Prints and Drawings of Musical Subjects, Item 29, 2011. The Augsburg Confession, the chief Lutheran creed, was prepared by Melancthon and read before the diet of Augsburg in 1530. This complex commemorative piece includes portraits of Luther and Melancthon, symbolic and historical vignettes, a four-voice setting of a Lutheran chorale and detailed depictions of a host of musical instruments. 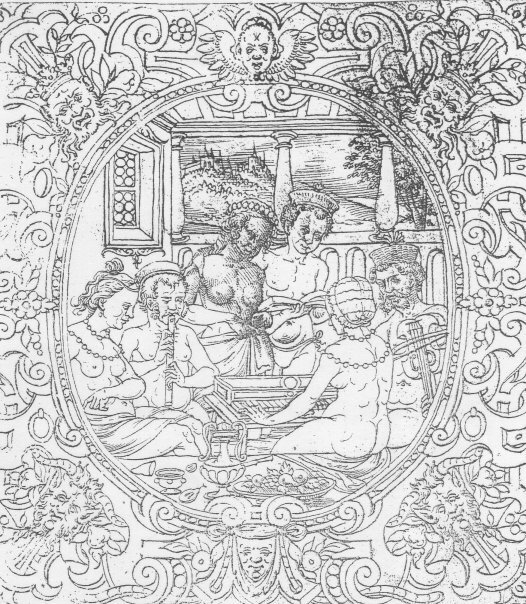 Musicians sing and play harpsichord, guitar, violin, double-bass and a pipe (only the head and upper body visible), possibly a recorder given the hint of its characteristic beak and window/labium. German draftsman known for his eccentric landscapes; between 1805 and 1808, he lived in Zurich where he made engravings after gouaches left by Salomon Gessner (1730–1788); born Berlin (1759), died Dessau (1835). 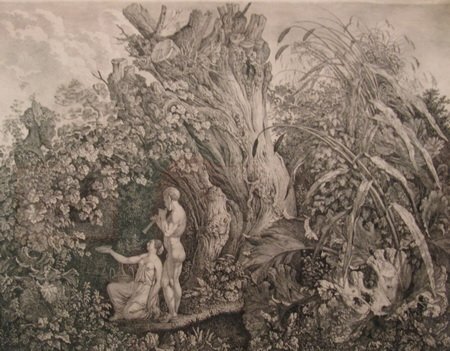 Pastoral, etching, Carl Wilhelm Kolbe (1759–1835). Ref. Website (Blog): Chroniques de-ci de-la: erbes géantes et arbres de fantaisie Dessins et estampes de Carl Wilhelm Kolbe (2010). In a phantasmagoric landscape two figures are dwarfed by giant vegetation. A woman in classical garb kneels to make an offering to a Pan-like figure glimpsed through the undergrowth. Beside her, a naked man plays a flared-bell pipe which might represent a recorder. Contemporary Norwegian draughtsman, lithographer and painter who lives at and work at Bekkestua outside Oslo; his subjects include portraits, figures, figure compositions, and landscapes; born Caracas, Venezuela (1958). Artist’s website. Flute-player Harald Kolderup (1958–). 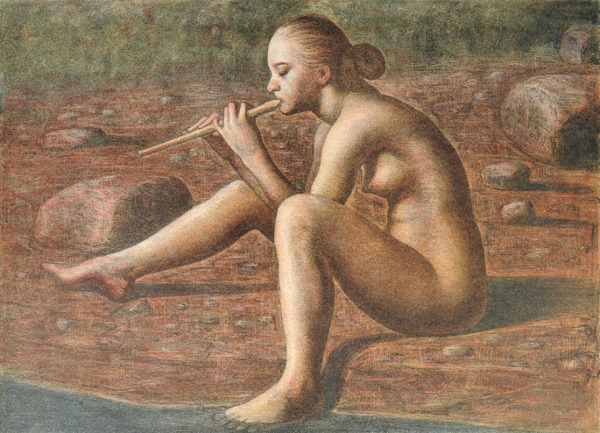 A naked young woman sits beside a stream playing a very slender pipe, probably a duct-flute although no details are visible. Dutch landscape artist and portrait painter; his panoramic landscapes, rich and warm in tone, suggest dramatic atmosphere and space and are among the best in the Dutch landscape tradition; born Amsterdam (1619), died Amsterdam (1688). Peasants in a Tavern (ca 1662), pen and brush and brown ink and brown gray wash on buff laid paper, 14.6 × 20.5 cm, Philips de Koninck (1619–1688) Detroit: Detroit Institute of Arts, 38.17. A group of peasant men carouse in a tavern. In the background, a standing man in what looks like a top hat plays a small slightly flared pipe (probably a recorder); beside him a seated man sings from an open book. German artist of the Cologne school; born Coesfeld (ca 1420), died Münster (1490). Assumption of the Virgin (ca 1457), attributed to Johann Koerbecke (ca 1420–1490). Madrid: Museo del Prado, Thyssen-Bornemisza Collection, Inv. 210. Ref. Staedel (1935: pl. 10); Anthony Rowland-Jones (pers. comm., 2001). There are five groups of angel musicians with different coloured wings – pink-red, orange-red, blue (2 groups), and white. The first group comprises lute, harp and singer; the second centrally placed group is a choir; the third group comprises fiddle, lute and singer; the fourth group comprises organetto and three singers; and the fifth group comprises a large psaltery with one angel playing and another angel holding it, and two joined duct flutes forming a double flute. “The small right-hand flute only has three finger holes, but the left-hand one has six finger holes in line and one offset after a gap before the cylindrical bell. In both instruments the window/labium is clear”; This painting was originally a panel from the altarpiece of Kloster Marienfeld, near Munich. German painter and teacher; his subjects depict society and personalities during the Weimar classical period in the milieu of the Duchess Anna Amalia (1739-1807) and her son Karl August; born Frankfurt am Main (1737), died Weimar (1806). Boy with a Duct Flute, chalk & watercolour on paper, 28.0 × 17.4 cm, Georg Melchior Kraus (1737–1806). Frankfurt: Städelsches Kunstinstitut, Städtische Galerie, 6109. Ref. Munich RIdIM (1999, Fsm-219). A young boy in a jacket and cap sits holding a soprano-sized duct flute (probably a recorder) of baroque design the beak of which is clumsily depicted but the window/labium and four finger holes of which are clear. The lower body and foot of the instrument are hidden in the palm of the boy’s right hand. Untitled (1994), James Kraus (contemporary). American Recorder 36 (4): cover (1994). A man (with curly white hair and glasses) and a boy (with a propeller hat), play stylised, flared recorders. Dutch painter; active ca 1675–1725. Still-life (1689), oil on canvas, Johann Kröger (op. 1675–1725). London: Sotheby’s, 1 November 2001, Lot 80. Ref. 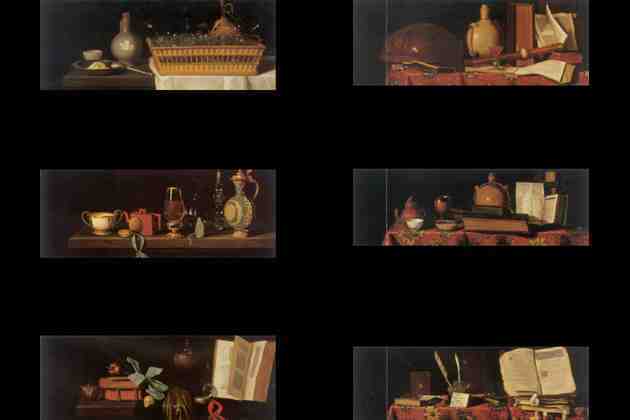 Gabrius Data Bank (2001, b&w); Rijksbureau voor Kunsthistoriche Documentatie 60298 (2010, col.) On a table draped with a tapestry lie musical scores, an hour-glass, a goblet, a terrestrial globe and a dark-coloured hand-fluyt. Signed on the back, Johan Krög* / Anno 1689 / Fec. A Group of Façon de Venise, Johann Kröger (op. 1675–1725). Location unknown. 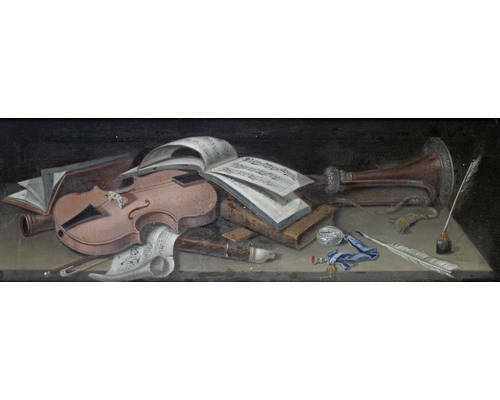 Gabrius Data Bank (2007, col.) A set of six small paintings, all still-lifes, one of which depicts a lute, a wine flask, books, a music-book, and a baroque recorder with an ivory ferrule between the head and body. Allegory of Music, 38.7 × 109.8 cm, Johann Kröger (op. 1675–1725). London: Bonham’s Knightsbridge, Sale 18674 – Old Master Paintings, 13 April 2011, Lot 63. On a table lie music books, a quill and ink, a watch, a violin and bow, a trumpet a trumpet, and a baroque recorder with ivory beak and mount, only the head and upper body of which are visible. One of a series including an Allegory of Geography auctioned with this. A series of a similar format, was offered for auction at Christie’s, London, 14 June 2002, Lot 624. The Feast of the Prodigal Son (1604), print, Werner Kübler II (1582–1621). Stuttgart: Staatsgalerie. Ref. Munich RIdIM (1999, Ssg – 221). A recorder is held by a boy at the bottom of the print next to another boy playing a drum. The recorder is of alto/tenor size. Its windway/beak is at the bottom of the head-piece, but the window/labium is at the top. German (Swabian) painter and draughtsman, best known for some 240 engravings documenting the Stuttgart wedding of Duke Johann Frederick of Württemberg to Barbara Sophie, Countess of Brandenburg (1609); born Gmünd (1571), died 1641. The Nine Muses (1611), Balthasar Küchler (1571–1641). Ref. Calendar: Musica (Bärenreiter 1981: 21, as Ladies Making Music); Archiv Moeck. Depicts the Nine Muses playing instruments of the time including viol, trumpet, lute, cornett, keyboard, viola da braccio, and an impossibly large bass recorder with a bocal. The winged horse, Pegasus, launches himself from the slope above them. The 12th of 253 illustrations by Küchler depicting the festivities for the marriage of Duke Johann Friedrich of Würtenberg in 1609. Contemporary Dutch painter and draughtswoman whose work includes portraits, flowers, abstracts, animals; born (1973). Artist’s web-site. Musical Composition (2009), acrylic on canvas, 60 × 80 cm, Jochina van Kruistum (1973–). Perfectly depicted tenor, alto and soprano neo-baroque recorders are crossed in front of a copy of van Eyck’s Der Fluyten Lust-hof. Behind them are a small bust and a swirling musical stave. German painter and stained-glass maker; he was apprenticed to Albrecht Dürer and took over most of the master’s commissions after his retirement from painting altar-pieces in 1510; born Kulmbach (ca 1480), died Nuremberg (1522). Coronation of the Virgin (1514), 117 × 79 cm, Hans Süss von Kulmbach (ca 1480–1522). Vienna: Kunsthistorisches Museum, Inv.-Nr. GG_2656. Ref. Visual Collection, Fine Arts Library, Harvard University, 373.K969.31C; Rasmussen (1999, Lute). Surrounded by winged putti and watched by a ? donor and two nuns, the Virgin is crowned to an accompaniment on lute and a flared-bell pipe (possibly a recorder – a shawm seems unlikely in this company) played by winged putti. Christ and the Virgin Before God the Father, oil on panel, 142 × 156 cm, Hans Süss von Kulmbach (ca 1480–1522). St Petersburg: Hermitage. Two panels which possibly formed the outer wings of a folding altar (or two wings from an organ). In the left-hand panel God the Father, enthroned, is serenaded by musical angels playing harp and a long transverse flute, and a row of putti playing curved horn, a ? cornetto, and a eight pipes (possibly duct flutes). The dove of the Holy Spirit, flying putti and winged heads hover above, and below more winged heads and two angels seem to be flying forward to welcome Christ and the Virgin who are depicted in the right-hand panel. Also on the right-hand panel are two angels, one holding a cradle and the other seven swords, symbolising the seven sorrows of the Virgin. Christ and Mary would seem to here represent intercessors, begging God’s mercy for the people on earth. In the bottom right-hand corner a grumpy-looking bishop holding a prayer-book looks heaven-ward. Hungarian portrait painter whose subjects included several musicians; his rich coloration and energetic design were combined in character portrayal searching for the reality behind the mask; born in Pressburg (1667), died Nuremberg 1740. Recorder Player, oil on canvas, 90 × 71 cm, János Kupezki (1667–1740). Budapest: Szépmüvészeti Múzeum. Ref. Website: Szépmüvészeti Múzeum (2001); Moeck (1999, b&w); Universitatario Olandese di Storia dell’Arte Firenze, Special Photo Study Collections, Image 0038354 (2009, b&w). A man plays a baroque alto recorder of elaborately turned design with ivory mounts. A sheet of music can be seen behind the player Thought to be a self-portrait of the artist. A copy of this painting has recently been made for Christian Starke by the Hungarian artist Judit Pöcs. Recorder Player, oil on canvas, 87 × 69 cm, after János Kupezki (1667–1740). London: Sotheby’s (1993), item 1027; New York: Sotheby’s, Old Master Paintings, 27 October 1993, Lot 70. Ref. Rijksbureau voor Kunsthistorische Documentatie (2001); Anthony Rowland-Jones (pers. comm., 2001); Gabrius Data Bank (2002, col.); Artfact (2003). A fine copy of the original in the Szépmüvészeti Múzeum, Budapest. See above. Portrait of Johann Zetz (fl. 1690-1732), oil on canvas, 95 × 78 cm, after János Kupezki (1667–1740). Prague: Dorotheum,Hotel Marriott, “Kunst, Antiquitäten und Schmuck”, 28 November, Lot 208 (2015). Ref. Šafařík (2014-77); Website, flickr, Pau NG’s photostream (2017-col.) A fine copy of the original in the Szépmüvészeti Múzeum, Budapest. See above. Portrait of a Man with a Recorder, oil on canvas,, János Kupezki (1667–1740). Hamburg: Hamburger Kunsthalle, No. 685. Ref. Anthony Rowland-Jones (1998); Moeck (1999, col.); CD Cover: Georg Philipp Telemann, The Seven Sonatas for Recorder Globe GLO 5211 (2005, col.); Bridgeman Art Library (2014: Image XKH147761, col.). 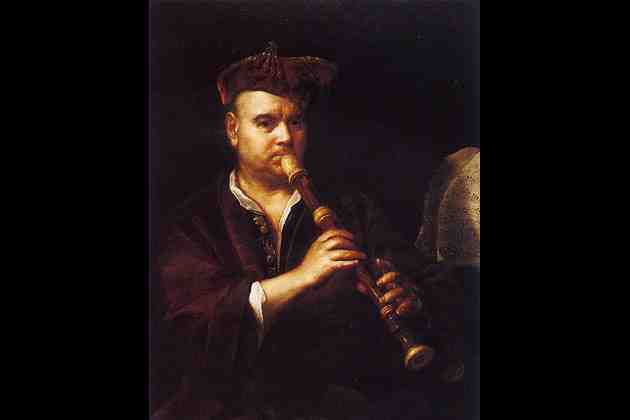 Across his chest, away from his face, a man holds a baroque alto recorder of elaborately turned design with ivory beak and mounts. He wears a red velvet hat, a white shirt with a ‘clerical’ collar, and a green and russet soft coat. His right hand is held lowermost. E quibus in solo vivendi causa palato est (1736), engraving, 23 × 35 cm, by Bernard Vogel (1683–1737), Nuremberg, after an original by János Kupezki (1667–1740). Celle: Sammlung Moeck. Ref. Tibia 2/97 (1997: cover, col.) The quotation is from the Satires of Juvenal. 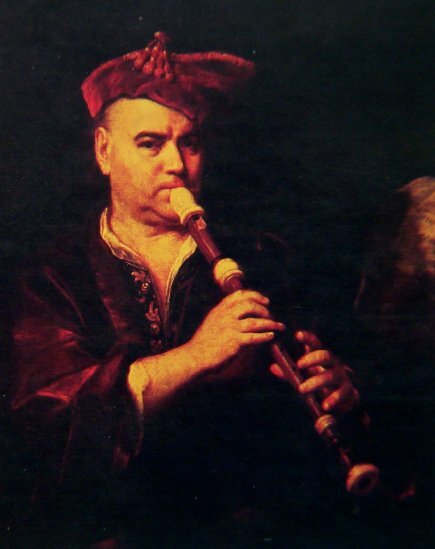 A peasant musician, his jacket and shirt open, drains a wineglass, a baroque alto recorder clutched in one hand. 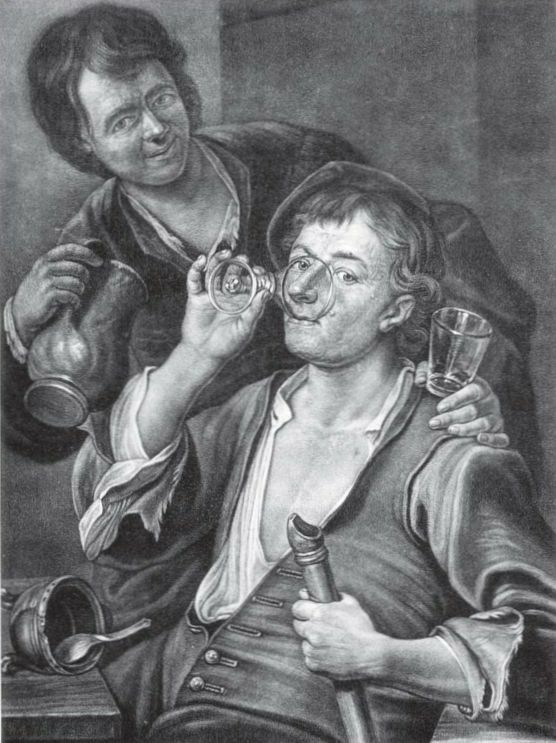 His drinking companion, a young lad, holds a glass beaker in one hand and a pewter jug in the other. German artist who lived and worked from 1946–1963 as an art teacher in Schwerin; born Dassow (1885), died Schwerin (1965/8). Boy with a Recorder (1939), drawing, Emma Kurz-Wilhelmi (1885–1965). Dresden: Sächsische Landesbibliothek – Staats- und Universitätsbibliothek. Ref. Website: Deutsche Photothek (2016). A young boy leaning on a table plays a modern soprano recorder, left hand uppermost.